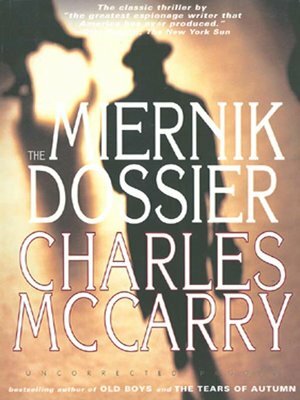 The Miernik Dossier is the dazzling first novel, newly reissued, by master spy novelist Charles McCarry. In this riveting, imaginative tale, five international agents embark on a road trip in a Cadillac from Switzerland to the Sudan. Among them are Paul Christopher, an American operative; Kalash el Khatar, the seven-foot-tall Muslim prince; Ilona Bentley, the beautiful half-English, half-Hungarian girlfriend of the British national, Nigel Collins; and Tadeusz Miernik, the shy and bumbling Polish scientist who might be the leader of a terror force that could set the Cold War aflame. Related as a collection of dossier notes written by the five characters, the novel reveals a complicated web in which each spins his or her own deception: each is a spider, and each a spy.